In preparation for an annual feeding frenzy, and to salute World Migratory Bird Day (WMBD), the Tofino Botanical Gardens, along with partners, Surfrider Pacific Rim, Raincoast Education Society, and Strawberry Isle Marine Research Society, will be cleaning up plastic pollution from the mudflats shoreline. The Tofino Mudflat areas and adjacent beaches bustle with busy bills frantically fueling up for a long and arduous journey. 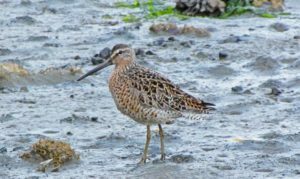 With 10’s of 1000’s of these feathered friends due to arrive on the shorelines, and the 22nd annual Tofino Shorebird Festival both quickly approaching, the aim is to help restore this critical stopover site and ensure the success of each bird along its migration route. If you’d like to learn more, stop by The Tofino Botanical Gardens, on April 13, 2019, from 10:30-1:30. Better yet, grab a bucket and some friends, head to your favorite beach or area of the Inlet, and help us this spring, as we welcome back the birds.